You have probably seen a Medium on TV, or maybe you have been to a public performance and watched a Medium do readings for a crowd of people, each one hoping to connect with a loved one who is no longer living. The chances are that you wondered how they do it. What is happening inside their head while they are doing a reading? How do they get the courage to stand up in front of people and bring through the Spirit of a loved one? Well, now is your chance to find out. Trust explains what goes on before, during and after a reading. It talks about the training involved and some of the joys and pitfalls. I discuss my experience as a Medium and I draw on the experiences of my colleagues. 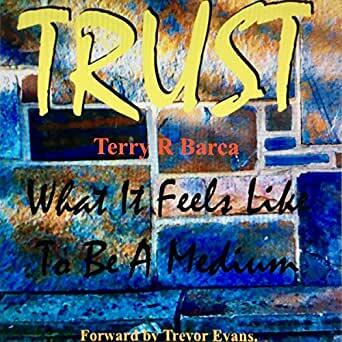 As a special bonus, I have included a number of fiction short stories that were inspired by Mediumship. I write fiction for a living, but this book is very much "real life". I love what I do and I want you to share in the wonder and the tears. It's been quite a ride and I know you are going to enjoy finding out what goes on inside the head of a Medium. All it takes is a little Trust. 5.0 out of 5 starsCompelling and Easy Read - "This is all way too much fun to get bent out of shape"
This book is a game changer (for me anyway) as well as being a compelling and easy read. I have read many, many, many books on mediumship. Most of them tend to talk about their lives and tell of readings they have given (which while enjoyable is not particularly helpful for a medium starting off). This book is different. It explains the problems the author - as a medium - faced and how the author dealt with the issues in a personable and straightforward manner. So, for all you out there with an interest in developing mediumship skills ... I recommend this book as, in a straight forward and, sometimes, humorous manner, it explains issues that mediums get and advice on how to deal with it. One of my favorite lines from the book : "This is all way too much fun to get bent out of shape".